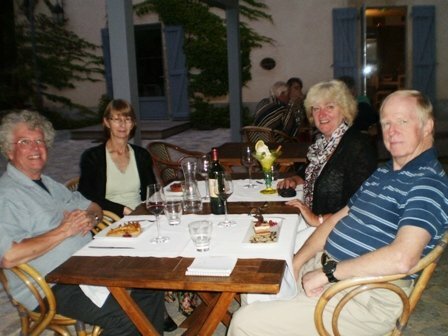 Or to be more accurate, Kathy & Charley Wood of Luberon Experience met up with Steve & Burman of Caves and Castles! It’s not often Slow Travel Tour group members get to meet up spread around as we are. Kathy & Charley having completed another round of successful Tours in Provence took the opportunity to visit friends who by co-incidence are neighbours of Steve & Judie! So it was too good an opportunity to miss. And in true French style, what better way to get to know one another than over a meal with, of course, a glass or wine or two. But there was another reason for this visit too. Next year Kathy & Charley are planning a Tour in this amazing area of caves and castles in which we are privileged to live and work. Lascaux II is probably the most famous of the painted caves in this UNESCO World Heritage Area whilst Castelnaud-la-Chapelle is arguably the most magnificent example of a castle around here. 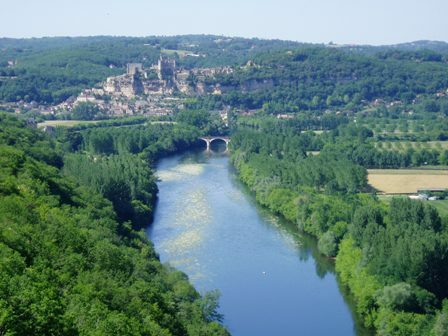 Sat on its rocky outcrop, it towers over the Dordogne river and landscape – the views are superb. Kathy & Charley are always meticulous in their planning so this visit was also about checking out accommodation, restaurants (tough work, but someone’s got to do it!) and, of course, the people who will be involved in the Tour. Steve spent a day with Kathy, Charley, their daughter Kelly and friend, Becky and gave them a taster of the experiences their guests will have when they visit this area. Lascaux II is a ‘must see’ – this incredibly accurate facsimile has to be seen to appreciate the scale and complexity of the art. It’s known as the ‘Sistine Chapel of Prehistory’ and when Picasso saw it he said “I can teach them nothing”. And yet it was painted 17,000 – 19,000 years ago. Awesome. A place that complements and enhances the visit to Lascaux II is Le Thot. Even more scenes from Lascaux can be seen there and also the techniques and materials that were used to produce both the original and the facsimile – the same in both cases AND without the aid of computers! Staggering. To round off the day, a visit to another atmospheric site – Grotte de Rouffignac. 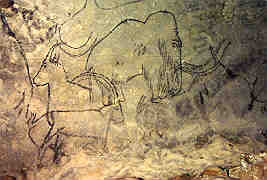 It’s known as the Cave of the Hundred Mammoths, although there are, in fact, 153 known mammoth images. There is a total of over 250 engravings and drawings within the cave. Access is by electric train which winds its way a kilometre into the cave. You can’t help but wonder what drew our ancestors so deep into the dark to create their works of art, facing unknown dangers with only the light of a fat lamp. As you travel through the cave you see hibernation hollows, once the slumbering places of the giant cave bears. Would the artists in Rouffignac 13,000 years ago have realised that these gigantic beasts of 25,000 years ago had been there? What might have lurked in there during the time of their visit??? A chilling thought. At the end of the cave, there is the opportunity to alight from the train and gaze in wonder above and around you at these images from so long ago. Fascinating. Travellers on Luberon Experience Tours have truly memorable experiences in Provence. This is just one quote from many on their website – “You guys make a very demanding job look effortless as you expertly create a comfortable, fun, educational, and entertaining experience for all” – and the same thought and care is going into preparing their new Tour in the ‘land of caves and castles’. Add in a Guide with knowledge and passion for his subject (“Hats off to a good teacher and good guide”), world class sites and you have a formula for a Tour that will never be forgotten! I would like to contact Steve and Judy, but their website has no address and the connection for contact doesn’t work. Can you send me their e-mail, or send mine to them? Thank you.